If you somehow managed to beat every single 3D enabled game available for the LG Optimus 3D, then there’s no doubt that you’re a serious gamer at heart of course. Exhausting all of your resources, you might actually be tempted to once again experience 2D games instead. Well, there’s some good news for LG Optimus 3D owners as the latest software update for the handset offers a 3D gaming converter feature that brings those stale 2D games into 3D. Even though it’s still sitting at Froyo, this software update carrying version V10K further enhances the smartphone’s functionality. 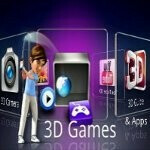 Rather than playing these 2D games normally like any other handset out there on the market, LG Optimus 3D owners will be able to transform and experience them in 3D with its auto-stereoscopic 3D display. However, this update is only available to unlocked models of the LG Optimus 3D that are part of the “European Open” region – with no indication when it’ll be coming to AT&T’s LG Thrill 4G. Furthermore, it’s not available in the form of an OTA update, but rather, it’s accessible via LG’s PC utility. i'd take this over the EVO 3D. the evo has a better screen, build quality, camera,htc sense, support from xda, and just looks better, so ya the only thing the optimus has going for it is the price. And im tired of you geeks always taking about which has the better cpu or some s**t like who f**king cares as long as it performs good with no to little lag im a happy camper and so is every one. Than, why are you on a tech site if discussions of tech makes you annoyed? Yes, no lag is the goal. But the "tech" side of it is what separates the elite devices. That is why people cruise these sites. To discover the elite performers and get the most for our money for a two year commitment. That being said, I agree with you on the EVO 3D. I do not think the Thrill/Optimus 3D is a bad phone at all. Just not as nice as the EVO. The 3D effect is a little richer on the LG in my opinion, but I think that the experience is just smoother and more efficient on the HTC for all the other aspects of a Smartphone. Both are on my shortlist for my Wife, who loves Android and loves fun features. your on a tech site whining about how tech geeks are comparing tech. you realize that makes you an completely oblivious to the point of a tech site right?? lolol build quality is preference/perception, there is nothing wrong with the thrills quality Im not a fan of sense, so i dont see it as a + the camera quality is near identical, and actually didnt they say the LG took better stills? :) the optimus not only has a much much better price it also has better 3d functionality, a vastly superior performance set up. Concidering how much power 3D takes, the better the set up is a must. Especially if you have crap like Sense just bogging down the phone to begin with. I watch the Sensation which shares the same hardware as the evo3d randomly chug. Cheap chips and bloat heavy software will do that. We all have our needs and wants, but your whining to tech geeks about how we prefer strong hardware set ups. thats what WE want. If its not the top of the heap, we wont touch it, and we darn will talk about and compare it to other phones. Quit whining about our preferences and just enjoy your phone. I disagree i dont think its the tech thats important but the real woeld performance is what i care about. I feel lik people talk bout tech for braggin rights and not because its makes the experience better. no you'll actually see much better performance on the Thrill simply because of the Dual-Channel RAM. the Droid 3 has the exact same specs as the Thrill 4G and it performs much better than the EVO 3D side by side, not to mention LG uses very light User Interfaces, even lighter than what Motorola uses so in real world performance it'll definitely go to the Thrill 4G. the EVO 3D is fast enough for people that don't really care about the extent of the phone's capability in the long run but i do and i know remixfa does too. Samsung has been using touchwiz for probably 4 years+ now. years before LG even made their first smartphone. LG is copying the look of touchwiz, but not the functionality. I dont care. It makes the phone colorful. I'm one of the few that actually likes full blown touchwiz as sammy has done some nice things with the extra features. i kind of understand what he means. even some of LG's older feature phones looked more like what TW is today than TW did all those years ago. so, if the thrill takes it for 3D implimentation, screen, and over all power.. whats left for the Evo? Design asthetics? that's okay, you just haven't learned the real finer differences between the SoCs to the extent that remixfa and i have. to really see the differences you have to push their limits, naturally any dual-core processor can do little tasks like navigating home screens and opening apps with ease but when you test them on games and flash content that's where the differences show up. on the HTC Jetstream for instance there's lag and choppiness found in playing flash content and 1080p videos and that's with a 1.5GHz S3, 1.5GHz! the Jetstream was one of the biggest Tablet fails of the year. for the best performance in order from worst to best it goes Qualcomm's S3, Nvidia's Tegra II, Texas Instrument's OMAP4 and finally Samsung's Exynos. in my opinion screen resolution isn't that big of a deal, naturally i'd take it if there were no trade offs but going with a Qualcomm powered phone over an OMAP4 powered one for it is wayyy out of the question. yeah i saw, it's ridiculous. Samsung's putting out that's for sure. that kind of power behind a stock Android experience. there's no words to describe that kind of power and beauty. no one said it doesn't support LTE.